What cool records will we find this year? 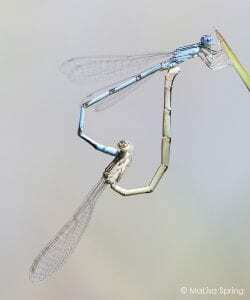 One of the challenging things about dragonflies and damselflies is that some species are seasonal. We have some species that start showing up in April and fly all year long. Other species have only been documented in May, rarely found afterwards. Thus, this blog is to help you target the April/May species and make sure you don’t miss out on the ones with short flight dates. 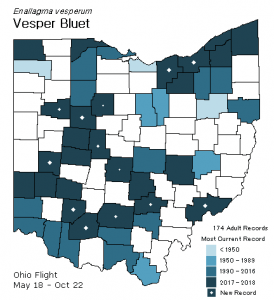 We do have a list of complete flight dates along with a separate page for 2018 Ohio species maps. It also wouldn’t hurt to review the locations you can access and try to document dragonflies. Although not complete, I have a short page on the types of habitats that you could check out for new species. Now, onto our early season dragons. 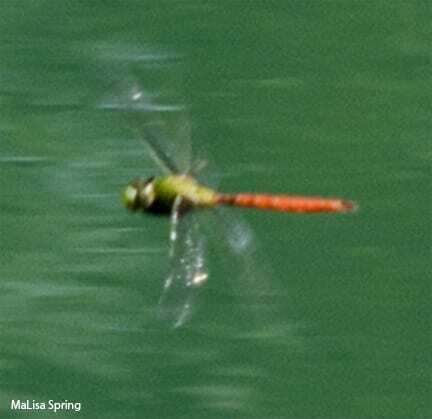 Almost every year, our earliest recorded adult is the Common Green Darner, Anax junius. It is a known migratory species, so we are likely enjoying the wave of adults as the move northward from their winter home. This Blue/Green dragon is known to taunt photographers and collectors alike. Aside from really cool days, it rarely lands and instead flies at impressive speeds, able to dodge most net and camera wielding naturalists. In 2018, our earliest records were on April 5th, followed by many people documenting them mid and lat April. 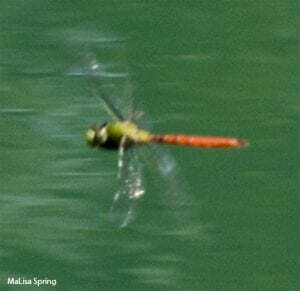 They can be challenging to document, but if you take the time to pan with the Common Green Darner, you can sometimes get a somewhat clear shot. However, we accept and appreciate any blurry photos, as these are still identifiable in their mostly blur images. Flight chart for all historical records in Ohio. As you can see by their flight chart, the Common Green Darner shows up early, but has highest populations midsummer. The Blue Corporal (Ladona deplanata), was also documented on April 5th by Sheree Cyra-Moorman, but it wasn’t reported again until May 1st. 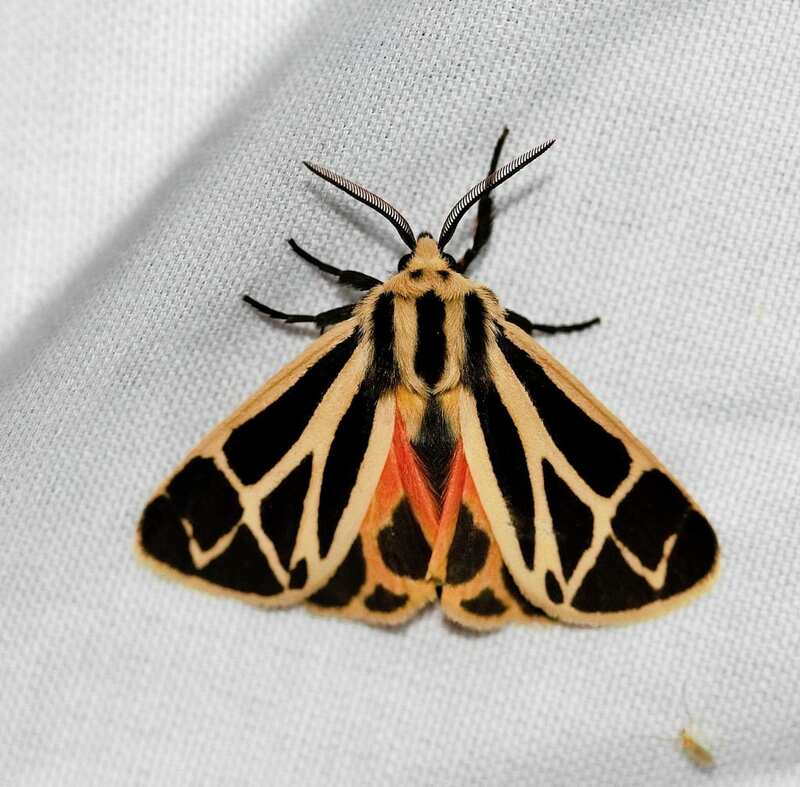 I have a separate blog just for this species, but if you are in central or southern Ohio, this is a species to watch. The Blue Corporal is listed as State endangered, but we have been able to document many in the last two years. Will you find one? Flight Chart of all historical Ohio Records. The Blue Corporal is a true spring species, rarely being documented past May. Make sure to visit clear, deep lakes in May to get a nice image of this State Endangered Species! 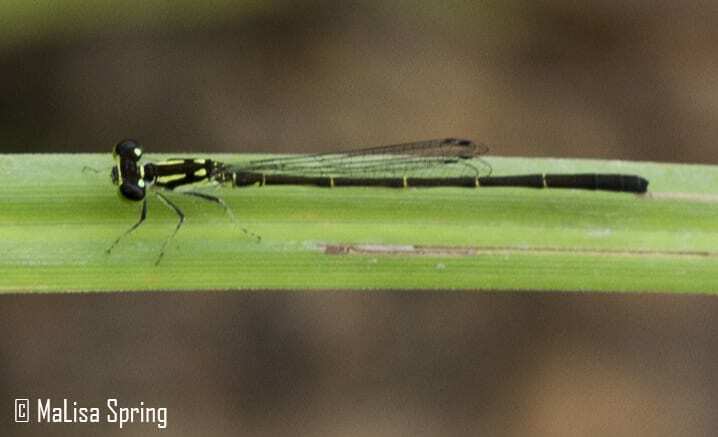 Our next species to be reported in Ohio was the Eastern Forktail (Ischnura verticalis), by Sarah White on April 21st in Montgomery County. Our dates this year will depend on the weather, but start looking once we have had a few days of 60s in a row. Not a perfect image, but you can at least see the main patterns used to identify the Eastern Forktail. The males have green thoracic stripes and two segments of blue at the end of their abdomen. 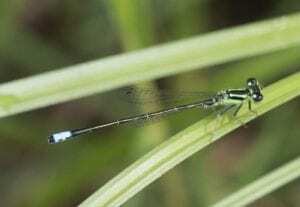 The Eastern Forktail has perhaps one of our longest flight periods. It emerges early and flies late. 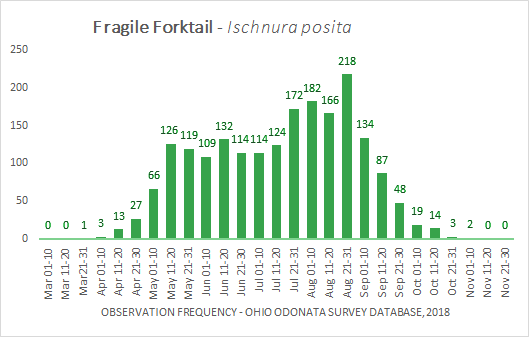 In 2018, it was not until the end of April that a Fragile Forktail (Ischnura posita) was first reported. Similar in size to the Eastern Forktail, the Fragile Forktail does not have the blue at the end of the abdomen and has a broken thoracic stripe. Fragile Forktails are found close to most aquatic habitats, often seen flying around in the grass near ponds and lakes. 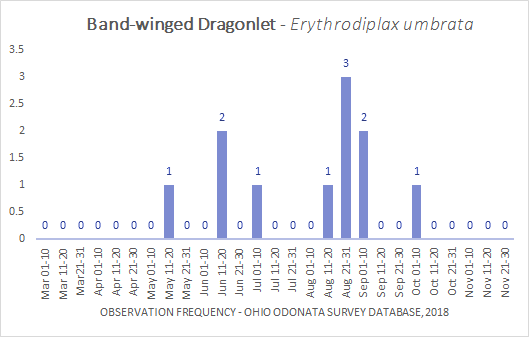 In 2018, we also had Uhler’s Sunddragon (Helocordulia uhleri) reported at the end of April in Adams County. This southern stream species is listed as State Endangered, so it is a rare find. 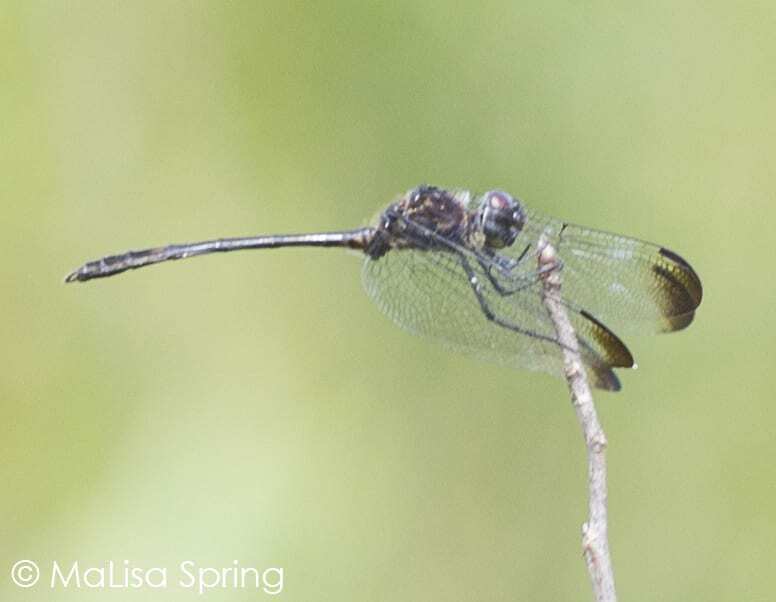 It looks very similar to a Common Baskettail (Epitheca cynosura), but has more black at the base of the wings and a slight widening of the abdomen near the middle. 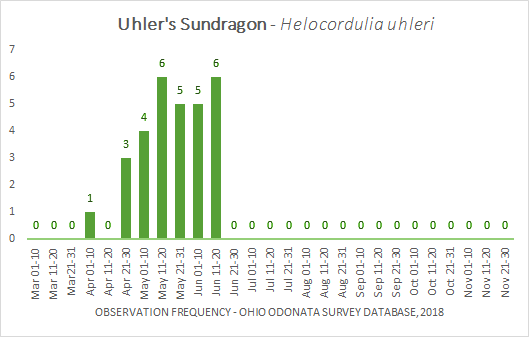 We have only documented Uhler’s Sundragon in April and May. Fingers crossed that we can find this at the Ohio Dragonfly Conference in Southern Ohio this year. Then, at the beginning of May, we start getting a lot more species emerging. Our first Southern Spreadwing (Lestes australis) was observed by Jim Lemon on May 2nd. 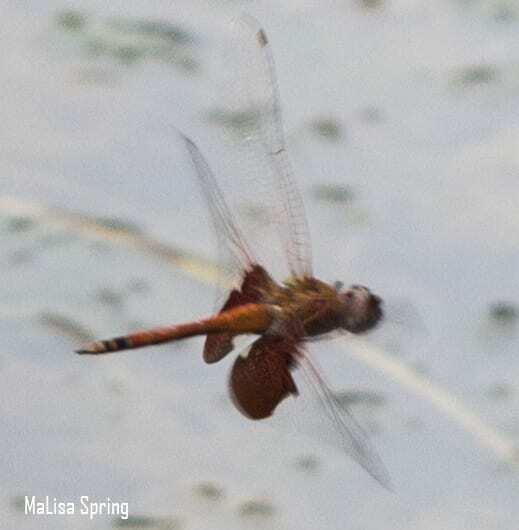 The first Carolina Saddlebags (Tramea carolina) was documented by Sarah White on May 4th. The first Painted Skimmer (Libellula semifasciata), was also documented by Sarah White on May 4th. Kim Smith spotted another Painted Skimmer the next day in Lucas County, ~170 miles north of the first observation. So as soon as the first southern person reports one, I would not be surprised to also see them being reported in northern Ohio. Painted Skimmers are similar to Halloween Pennants, but have less orange in the wings. 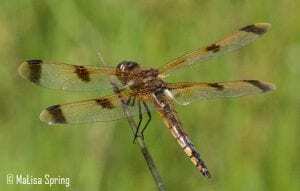 The Painted Skimmer abdomen is also black in the center and orange along the edges, compared to the Halloween Pennant, which has black edges and orange/yellow in the center of the segments. The Painted Skimmer is an early season ode, with most of the observations occurring in May and Early June. By May 5th, we had reports of Swamp Darners (Epiaeschna heros) in Ottawa County (northern Ohio). By May 6th, we had our first reported Citrine Forktail (Ischnura hastata) at Cox Arboretum in Montgomery County, again by Sarah White. Male Citrine Forktails are somewhat easy to ID if you can see them. Their abdomen is mostly orange with green thoracic stripes. Their small size makes them otherwise hard to notice. 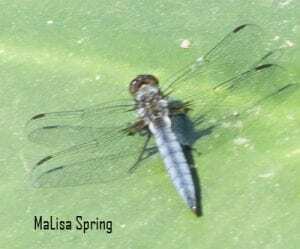 Also on May 6th, we had our first reports of Springtime Darners (Basaieschna janata) in Logan County by Danielle Hodges and Jim Lemon. True to it’s name, it emerges in the spring. The Springtime Darner can be tricky to document without first netting it and carefully holding it by the wings. 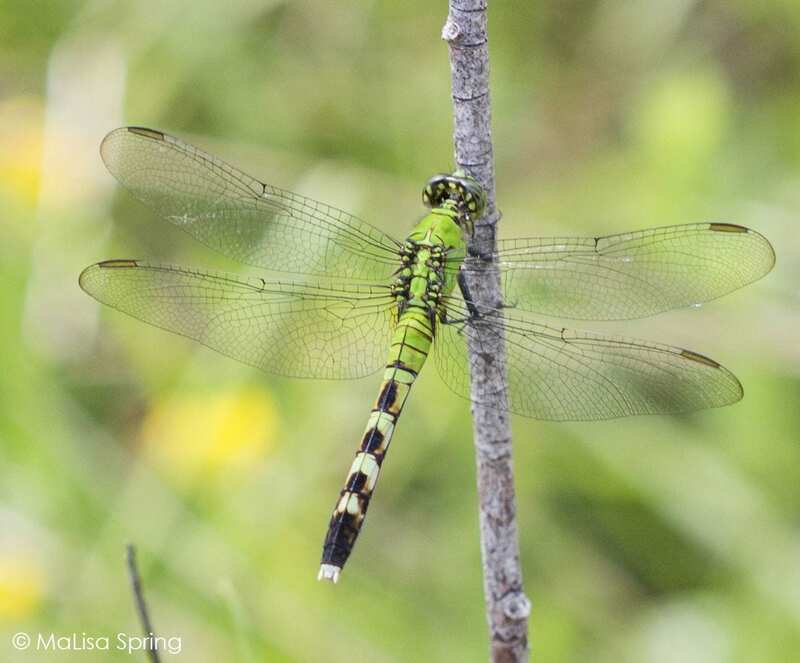 In addition to the blue on the abdomen and green thoracic stripe, the Springtime Darner has characteristic brown at the base of the wings that helps differentiate it from other darners. 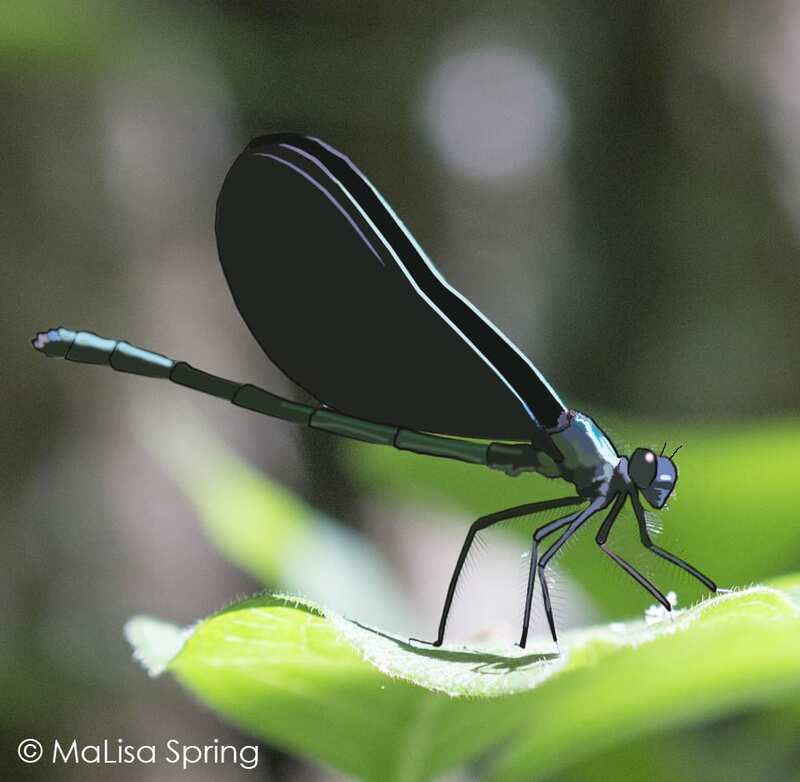 By May 9th, we have lots of observations of the above species and our first observation of the Ebony Jewelwing (Calopteryx maculata) in Summit County. 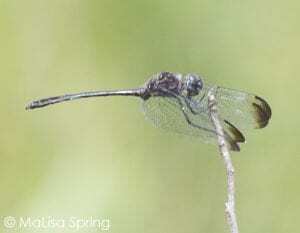 Then finally on May 10th, Jim Lemon spots a teneral Common Whitetail (Plathemis lydia) emerging in Champaign County. 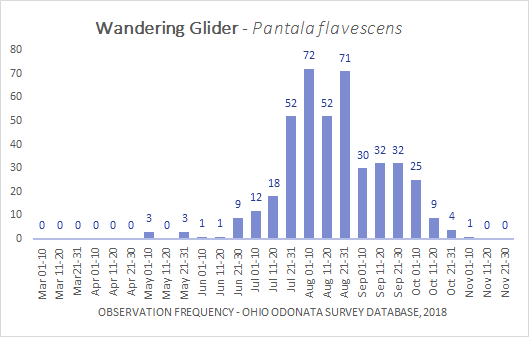 By May 10th, Sarah White recorded the first of the year records for Wandering Gliders (Pantala flavescens), Blue Dashers (Pachydiplax longipennis), Orange Bluets (Enallagma signatum), and Skimming Bluets (Enallagma geminatum). 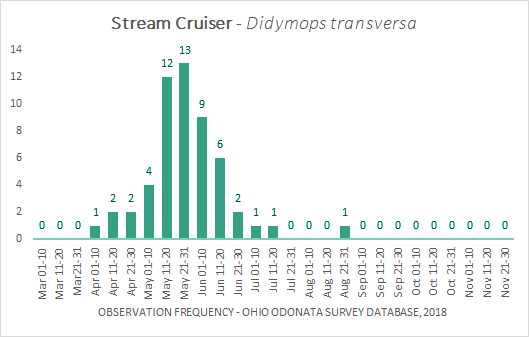 Also on May 10th, Jon Cefus and Kent Miller documented the first Stream Cruiser (Didymops transversa) of the year! 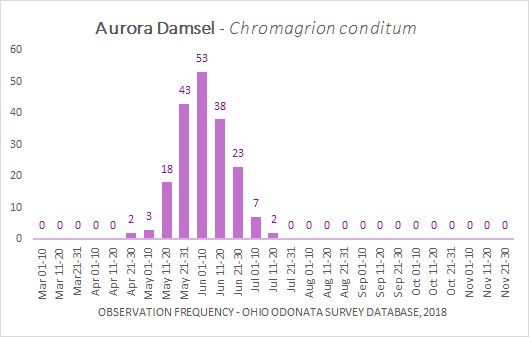 Finally, on May 11th, MaLisa Spring documents the first Ohio records of Aurora Damsel (Chromagrion conditum) and Common Baskettail (Epitheca cynosura) in Vinton County. The Aurora Damsel holds its wings like a spreadwing, despite being in the Pond Damsels Family. It also lacks the typical thoracic stripe and instead has a black outline similar to a guitar/bottle/gummy bear on the top of the thorax. The Aurora Damsel is only found in the Spring, so make sure to keep an eye out for it. The Common Baskettails are only found early in the season. These can be challenging to identify without a clear shot of the male terminal appendages from the side or the female subgenital plates from underneath. 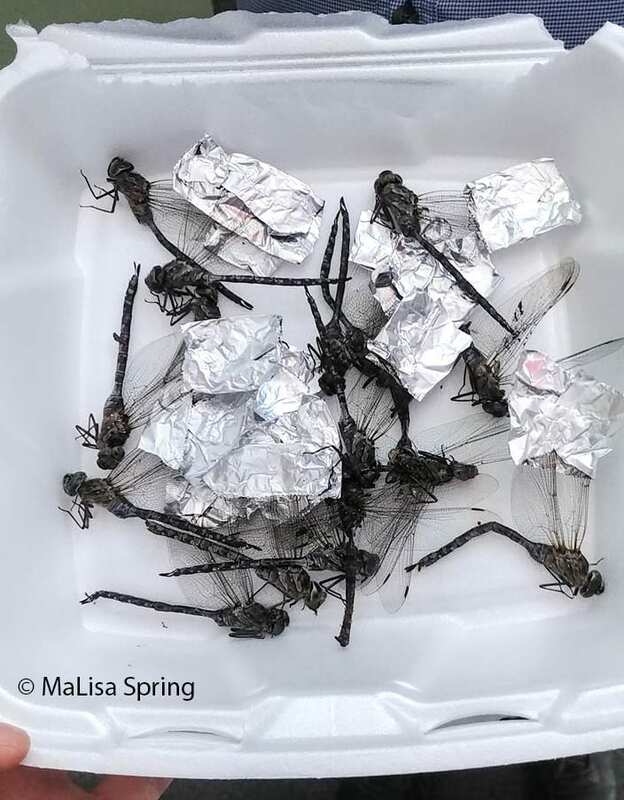 By May 12th, we have our first Ohio reports of Twelve-spotted skimmers (Libellula pulchella) and Black Saddlebags (Tramea lacerata) in Warren County. 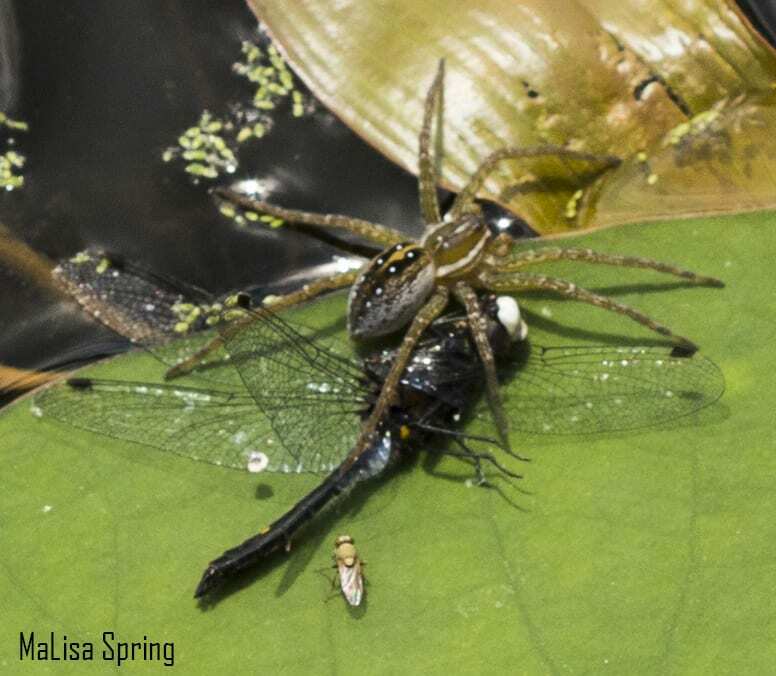 May 12th also brings our first report of Double Striped Bluets (Enallagma basidens) in Montgomery County, Ohio by Sheree Cyra-Moorman (who also spotted Black Saddlebags that day). The Double Striped Bluets are small and somewhat easily overlooked. True to their namesake, they have an extra stripe on their thorax, breaking up the black with a thin blue stripe. 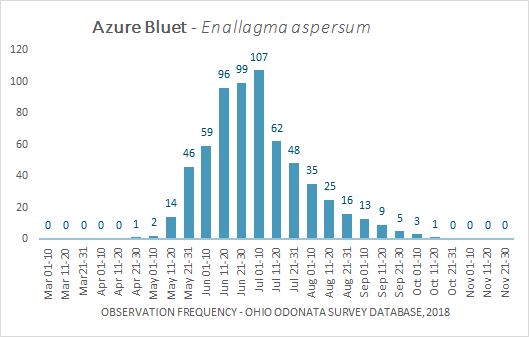 In 2018, May 13th was our first day we had reports of Azure Bluets (Enallagma aspersum) in Franklin County by Alisa DeMatteo. Jim Lemon also spotted the first Eastern Red Damsel (Amphiagrion saucium) in Champaign County on May 13th. The Eastern Red Damsel is mostly red, with black only on the top of the thorax and at the last four segments of the abdomen. 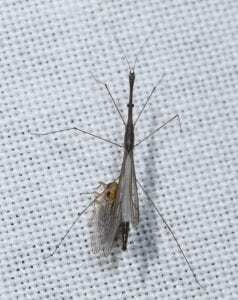 By May 15th, we have our first report of a Familiar Bluet (Enallagma civile) along with a Pronghorn Clubtail (Phanogomphus grasilenellus) in Greene County by Sarah White. Jim Lemon also spots a Familiar Bluet in Shelby County that day. 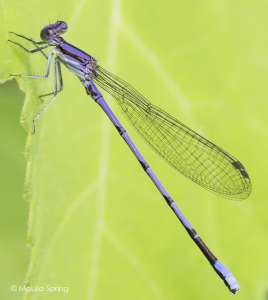 Jim Lemon spots the first Violet Dancer (Argia fumipennis) in Miami County and the first Eastern Pondhawk (Erythemis simplicicollis) in Shelby County on May 15th. 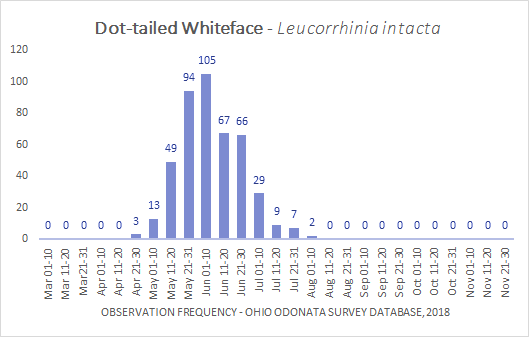 In Lorain County on May 15th, we have our first of the year Ohio record for the Dot-tailed Whiteface (Leucorrhinia intacta). The Dot-Tailed Whiteface is a mostly black dragon with a conveniently white face, and you guessed it, a dot on its tail. In Champaign County on May 15th, Alisa DeMatteo is on a different adventure. She found both the First Of the Year and first record since 1934 in Champaign County for the Band-winged Dragonlet (Erythrodiplax umbrata). After 84 years, when the species was first reported in Ohio, Alisa was able to document this rare species once again for Champaign County. 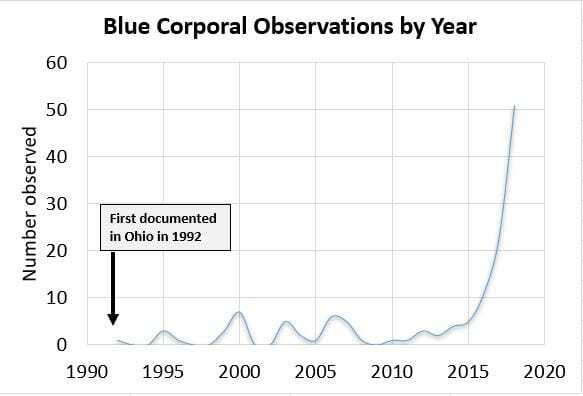 A different population was known from Northeastern Ohio in 2006 and 2007, with only two other reports in the state, once in 2014 in Lorain County and again in 2018 on the 4th of July in Ottawa County by Ryan Jacob. Regardless, this is a great find that only shows up rarely in Ohio. This rare dragon has only been found in Ohio a few times. Maybe you will spot one this year? That is enough records for now. The above species should give you an idea of what you might expect in the next month or so. Look out for part 2, which will list the First Of the Year 2018 records for the latter half of May. The key takeaway from the above is that once the species is mentioned, we then begin to see lots of people reporting them. So if they are spotted once somewhere in the state, expect them to be out and flying in other parts of the state in short order. For the data nerds, Jim Lemon has compiled the below information. Thanks again to all of the many volunteers who have contributed data via iNaturalist. We would not be able to do so much if it was not for you. 2018 was a record year in a lot of ways, with a record number of observations, species expansions, and new county records. 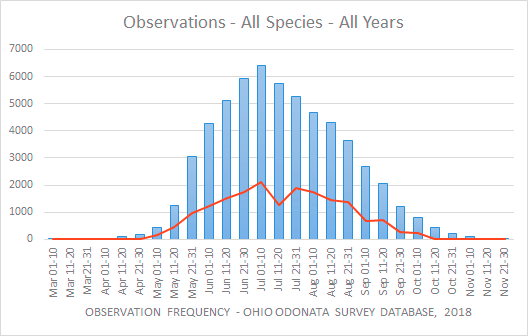 To put this in comparison, above is a bar chart showing all observations ever recorded in the Ohio Odonata Society database. The red line is just data from 2018! 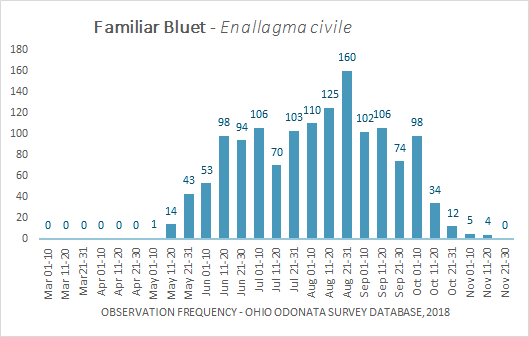 (Note the dip in observation numbers in mid-june, coincidentally the date MaLisa Spring, Jim Lemon, and Dave McShaffrey were in Minnesota for the Dragonfly Society of the Americas conference). In two years, we have doubled our known observations. 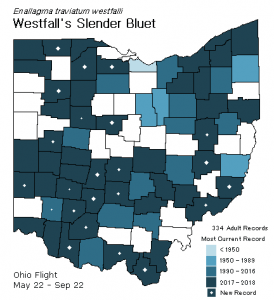 It took the Ohio Odonata Society a DECADE to compile both specimens and old records from publications and museums to reach around 30,000 records. In two years, we have gotten 35,000 observations on iNaturalist! So thank you very much to everyone who has helped us reach these numbers! We cannot say that enough. Now onto the fun data. These numbers reinforce the thread – more people lead to more observations, which lead to more species being seen. Surprise! 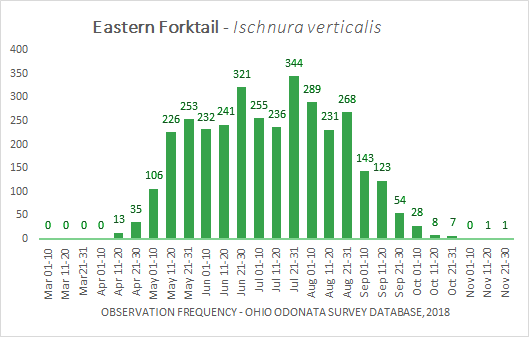 Eastern Pondhawk is our champion for most observations across Ohio! If there is one dragon you are most likely to find, it is this beast. It’s interesting to see the slight changes in order in the most observed. 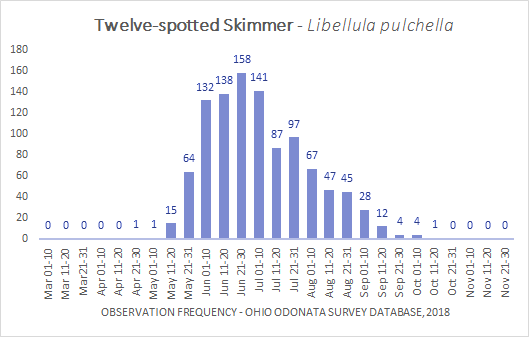 No surprises, any of these species could be expected through most of the season, especially Jun-Jul, anywhere there’s water. The Hine’s Emerald is a Federally Endangered Species, that was described from specimens in Ohio. (And also named after one of our key dragonfly collectors, J.S. Hine). Alas, it has not been documented in Ohio since 1961. So, are you going to go out this year and try to find these missing species? Let us know if you think you found them! 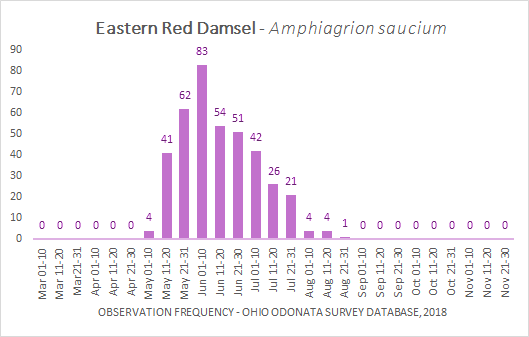 The Ohio Odonata Society maintains a database for our Dragon/Damsel records. Key data are species, date, and location (including county). The earliest record date for a species in a county is known as the “County Record”. This can be a bit of a moving target as observations/specimens come to our knowledge. But it’s interesting to note county records at discrete moments, and update appropriately. New county records can mean different things – 1) part of it is simply having someone making observations, 2) part of it is species expanding their range, 3) part is irruption (sudden change due to various factors). 2018 was a banner year for new County Records. We had 286 County Records, far above any other year in our data! Map of the new 2018 County Records. The darker the color, the more records found in that county. Looking at the map, most of these are towards the edge of the state, if not a border county. More observers leads to more observations and subsequently new county records. If we look at the species having the most recent County Records, we see a different look. 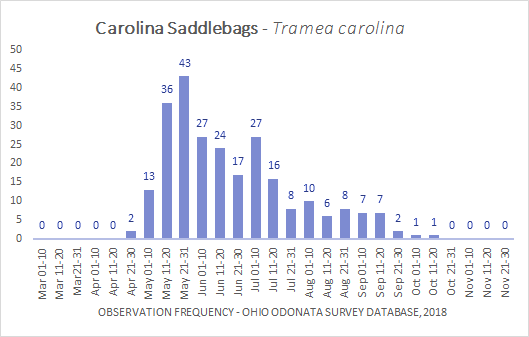 One story here is the big numbers for Carolina Saddlebags in 2018 – 15 County Records and reported in 25 other counties. While the State Record was established in Fairfield Co in 1895, after that there are many multiple year gaps in the data. Not until 1995 were there reports in more than two counties. 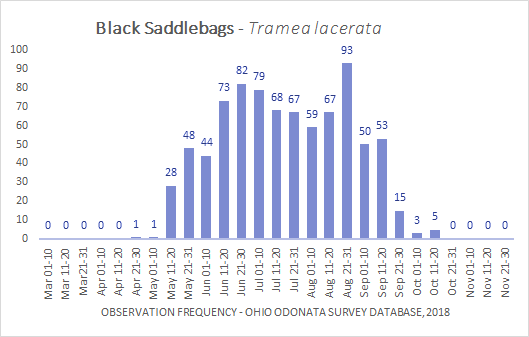 Saddlebags are migratory, and many of our 2018 observations (but not all!) were early in the season – so we might have been on the receiving end of a successful brood in the Gulf States. Carolina Saddlebags have a large patch of red in their hindwings and a mostly red abomen with the exception of abdominal segments 8 and 9, which are mostly black. This species is prone to hovering, so it is not as easy to get a clear, sharp shot for ID. Slaty Skimmer has more county records (26) in the last three years than any other species. This is another that was first observed in the 1800’s – Erie Co in 1896, but then recorded very infrequently until our first statewide survey in the 1990’s. Observations and county numbers have climbed every year for the last five. In addition to the new county records, Slaty’s were reported in 60 counties in 2018. This is a pretty classic range expansion – and 20 counties still needing Slaty observations. 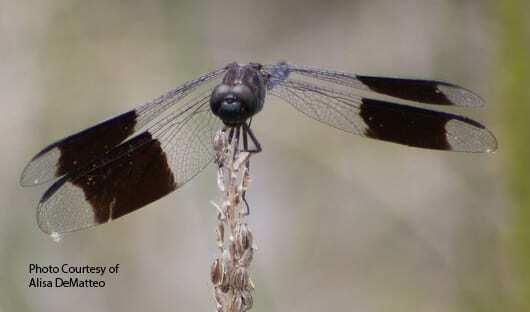 The Slaty Skimmer is sometimes called the Blueberry Dragon, as its skin is similar in color to a ripe blueberry. These will often perch for you, making a photograph slightly easier if you can find them. They have clear wings with completely black stigmas (the weird dark cells at the top of the wings). 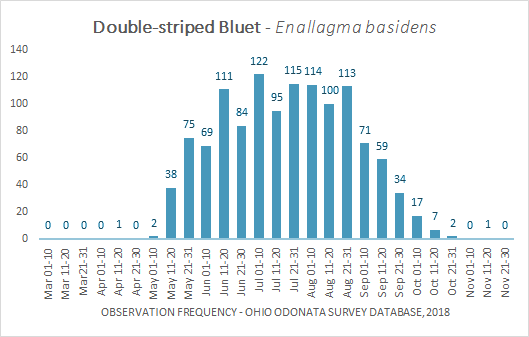 Our next two – Westfall’s Slender Bluet (23) and Wandering Glider (22) – are most likely the result of having more people out looking. 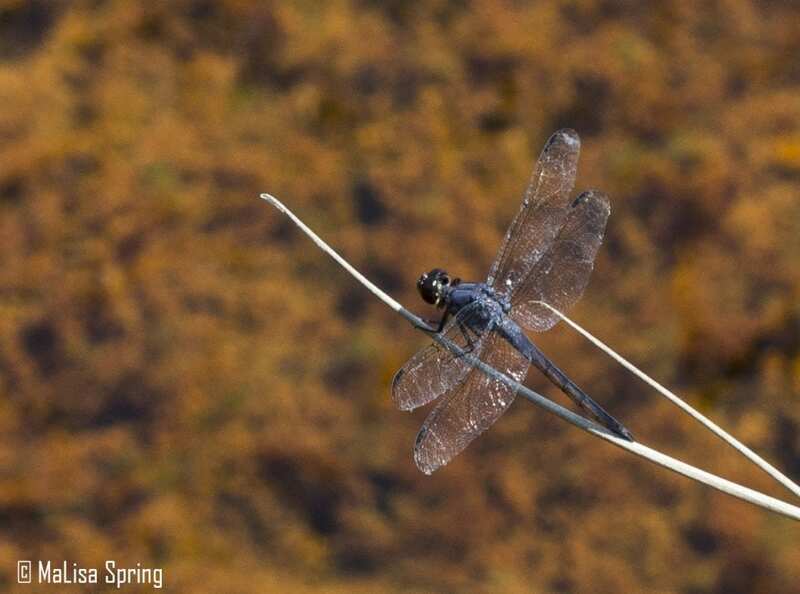 Wandering Glider is our global Odonate – and not uncommon, so just have people out looking is key. 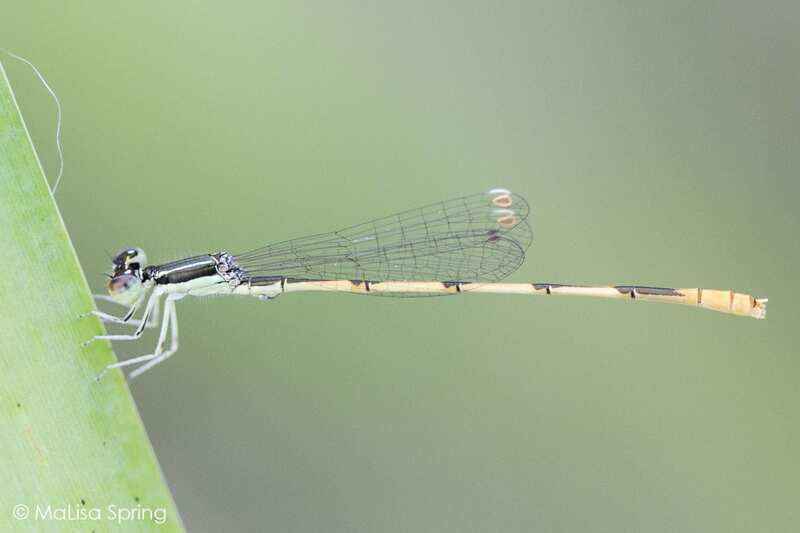 Westfall’s Slender Bluet is not a strong flier and is similar to several of our other Bluets – but just having people look around is likely a big factor. The Wandering Gliders are about as frustrating to net as they are to photograph. They don’t even rest for mating, instead doing it on the wing! These pernicious hovering dragons will constantly move and dodge, to the frustration of photographers and specimen collectors. Many field groups spent a lot of time trying to document these last year. We would have records for these statewide if they would just sit still for a little bit more. They are also sometimes called flying carrots or flying cheetos, owing to their orange coloration and angular abdomen. 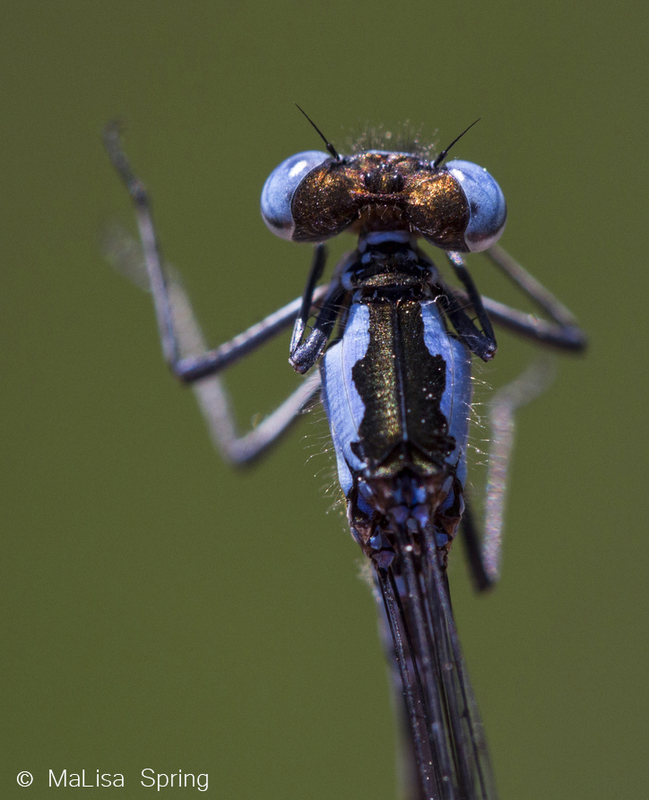 Westfall’s Slender Bluet is one of our easier male damselflies to identify with large blue eyespots, taking up most of the back of the head. The tip of their abdomen is also mostly black with only small rings of blue along the anterior (front) edge. Then it is not until the 8th and 9th segment that the abdomen is covered in blue again. 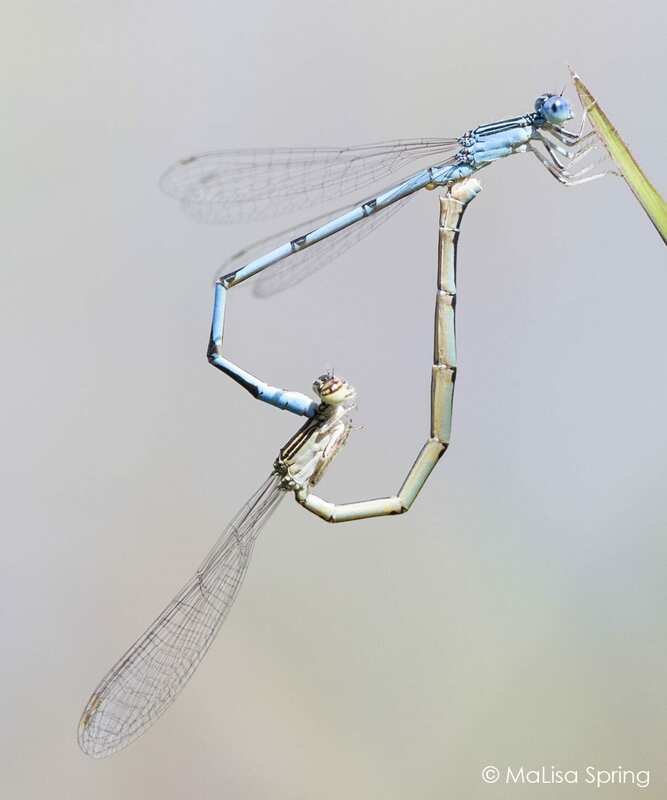 They also have narrow thoracic stripes, with more blue on their thorax compared to the other blue damselflies. This pair is in tandem, with the male grasping the females neck as a form of mate guarding or protection. 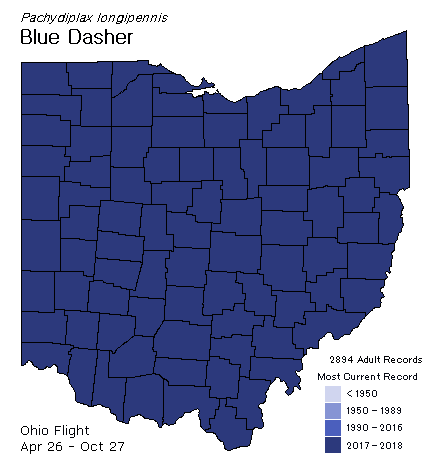 Look at Blue Dasher – all dark blue – somebody submitted an observation from every Ohio county in 2018! Our only species for 2018 with this distinction. 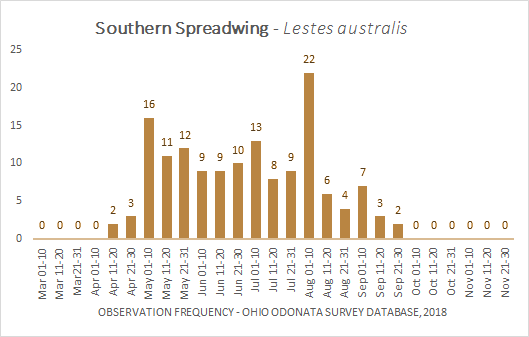 We also see that it’s been recorded from late Apr through late Oct – a long flight. With almost 2900 records, it is one of our most common dragons. Our most common dragonfly across the state, the Blue Dasher is found at most ponds and lakes in high abundances. Now look at Comet Darner – see all three different dot sizes. Also note the wide distribution across the state – these things are terrific flyers. Note the color variation – older records are not as dark. These are probably in every county at some point – you just need to be in the right place at the right time. 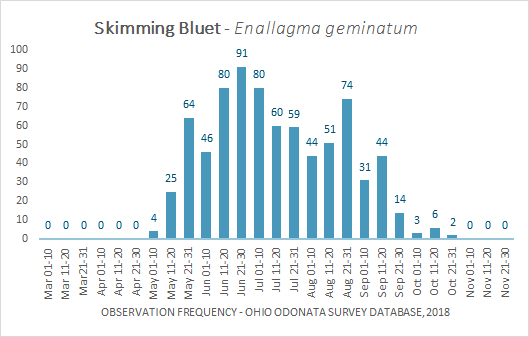 Comet flight is shorter (Jun-Jul) than the Blue Dasher, and has considerably fewer observations – so, more of a challenge! 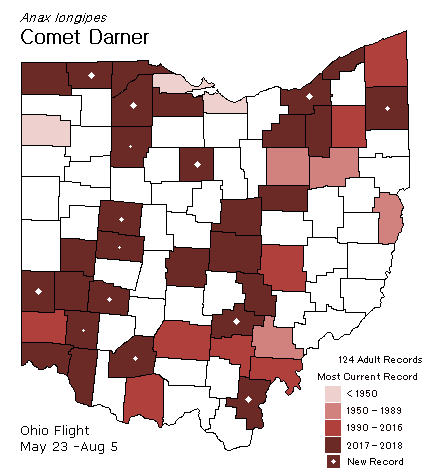 Perhaps part of the reason that Comet Darners are so poorly documented across the state is of their reluctance to perch and pose for a photograph. Many observations end up with a blurry photo like the above, but it is enough to ID. Finally, look at Swift Setwing, one of our newest Odonates. First observed in Champaign Co in 2014, then Greene Co in 2016 (small dot), Muskingum and Montgomery in 2017 (medium dot), then five new counties in 2018 (big dots). This is an example of range expansion. There are no “old” records – so the location counties are all the darkest color. Then look at the spread – Swift Setwing wouldn’t be a surprise anywhere in the state. If we continue the trend, we should find 5 or more new county records in 2019. The Swift Setwing is on our “To Find” list for 2019. Will you get a county record by finding this beast? Next look at Unicorn Clubtail. While its’ numbers are lower than Blue Dasher, we still see a reasonable curve with a tighter peak – pretty much in June. 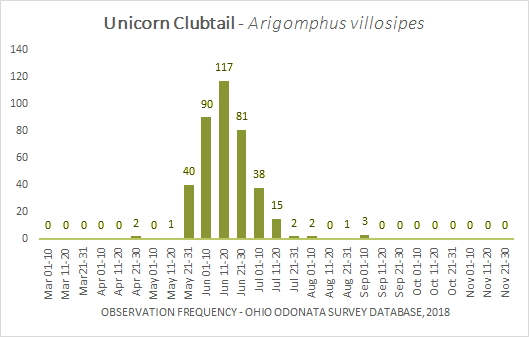 While we see a data point in September, specifically finding a Unicorn after mid-July would be pretty uncommon. 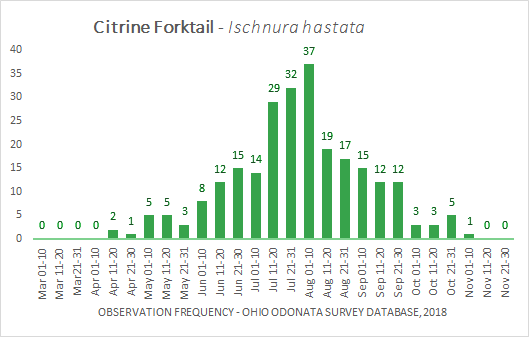 Given the widespread range for Unicorn Clubtails, search for them in June in any of the 22 counties where they have not yet been reported. 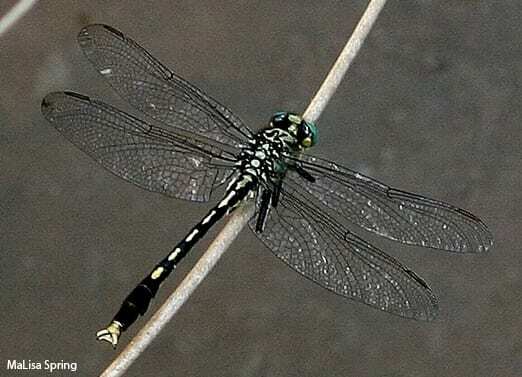 Most of the clubtails are tricky to ID, but the Unicorn clubtail is one of the few with distinct characters of yellow cerci (the prongs on the tips of the tail) and the last abdominal segment entirely yellow. They also have a small bump on the top of their forehead if you can get a clear enough view. 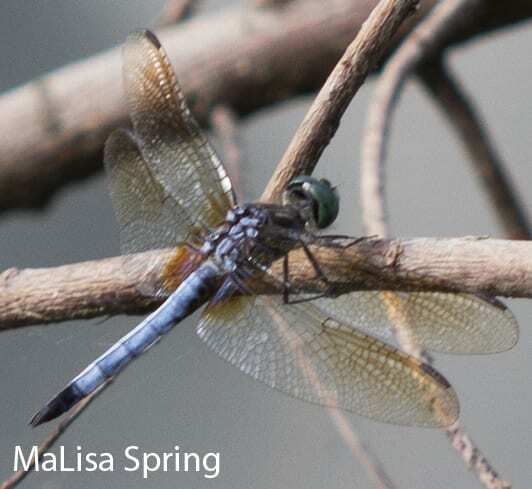 The Blue Corporal might be mistaken for a Blue Dasher, Pondhawk, or Slaty Skimmer, but has two dark patches on the bases of the hindwings not found in the other species. As the flight chart suggests, it also flies much earlier in the season than its more common cousins. Let’s talk about a weird dragonfly in Ohio. 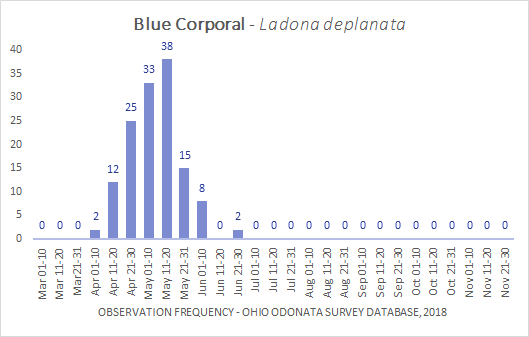 First officially documented in 1992, we have no earlier records of the Blue Corporal (Ladona deplanata). The only one I have seen wasn’t very cooperative. I have a single out of focus shot, followed by several attempts to net it. 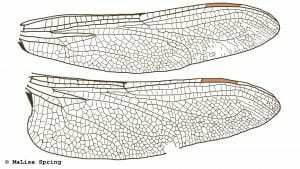 Due to its limited range and poor documentation, the Blue Corporal was considered worthy of listing as a species in trouble. Thus, it gained status as State Endangered in Ohio. And it is not like people weren’t looking for dragonflies in Ohio. In the 1990’s, there was a dedicated attempt to survey the state, which is part of why we know it is here now. They also looked through museum records and publications, but the earliest record was still 1992. 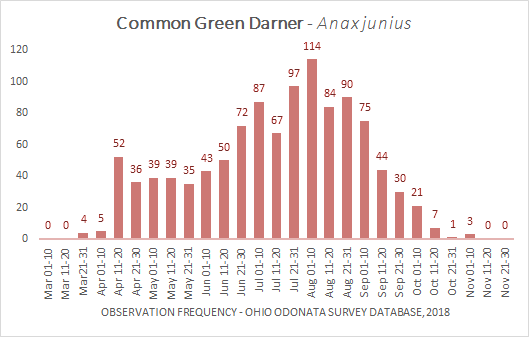 The 1990’s Ohio Odonata Survey ended in the 1990s (surprise) and then effort to look for dragonflies in Ohio waned. 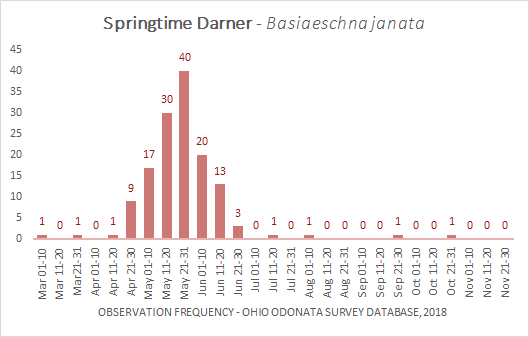 Then I got my job as the State Coordinator of the Ohio Dragonfly Survey in the spring of 2017. Now there are lots of amazing volunteers out photographing dragons! And guess what? Those Blue Corporals? In the last few years, we have had many people documenting them! The numbers are still somewhat low, but last year we found 51 of them!! What’s more, now that we have enough observations, we can start to understand the regionality of the species. Oddly enough, the Blue Corporal is mostly documented south of Interstate 70. Map of the iNaturalist records for Ladona deplanata as of Jan 30, 2019. We also do not see many observations in the eastern most portion of southern Ohio. Perhaps in part because we have very few people surveying there. Tie in the fact that this species flies mainly in April and May, means a very limited window to document. Should this species still be listed as State Endangered? I’m not sure and that isn’t my call to make at this time. I am happy to see it showing up in many more spots. Hopefully, we will get more people out this year to document them even better! Do you think you have seen one? Submit it to iNaturalist so we can confirm the record and add it to our database! 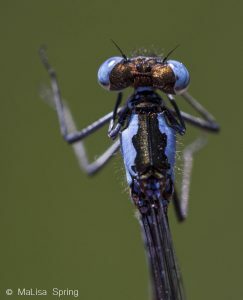 The Blue Corporal males have a wide thorax and abdomen that is a light or slate blue. The base of the hindwings is diagnostic, with a splash of black. You might mistake a male Blue Corporal for an Eastern Pondhawk (has a green face and white cerci), Blue Dasher (black tip of the abdomen, generally skinnier), or Slaty Skimmer (darker blue body, generally skinnier, perches off the ground). 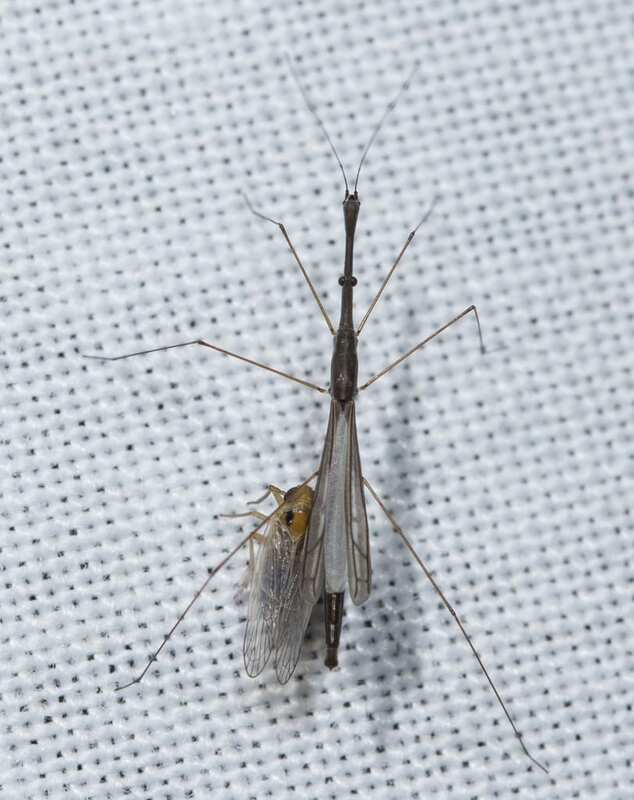 All of the similar species fly later in the season and are less likely to be found in April/May in Ohio. 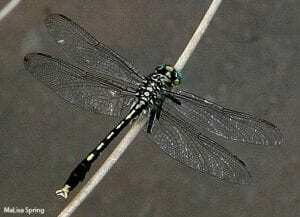 Females look similar to baskettails with a mostly brown body, but also are generally wider. From Left to Right: Eastern Pondhawk, Blue Dasher, and Slaty Skimmer. 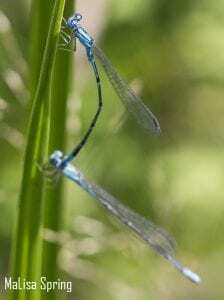 These are some of our more common blue dragonflies in Ohio, present at most lakes and ponds midsummer. 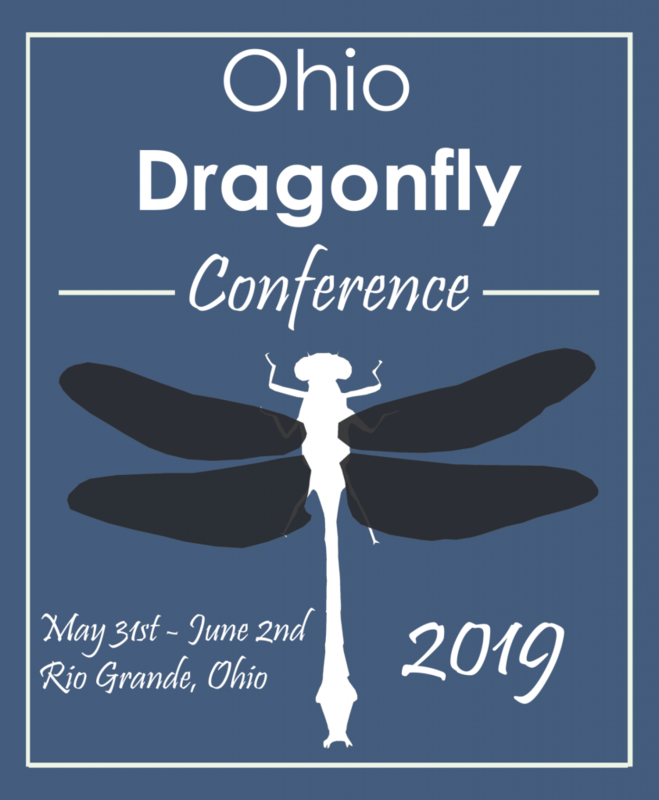 Ohio Dragonfly Conference registration live! It is set to be a great conference this year in Rio Grande, Ohio (southern Ohio) on May 31st – June 2nd. We hope to see the state Endangered species of Blue Corporals and Uhler’s Sundragons among many other cool species. This is a conference for beginners and advanced alike. We will have introductory identification presentation for those new to the world of dragonflies, followed by several more in depth presentations on identification and ecology. There will be plenty of other fun presentations including some on photography, gardening for dragonflies, and local natural history. Our keynote speaker is Michael Moore! Michael Moore is a research biologist who investigates how animal life cycles and mating interactions adapt to different environments. 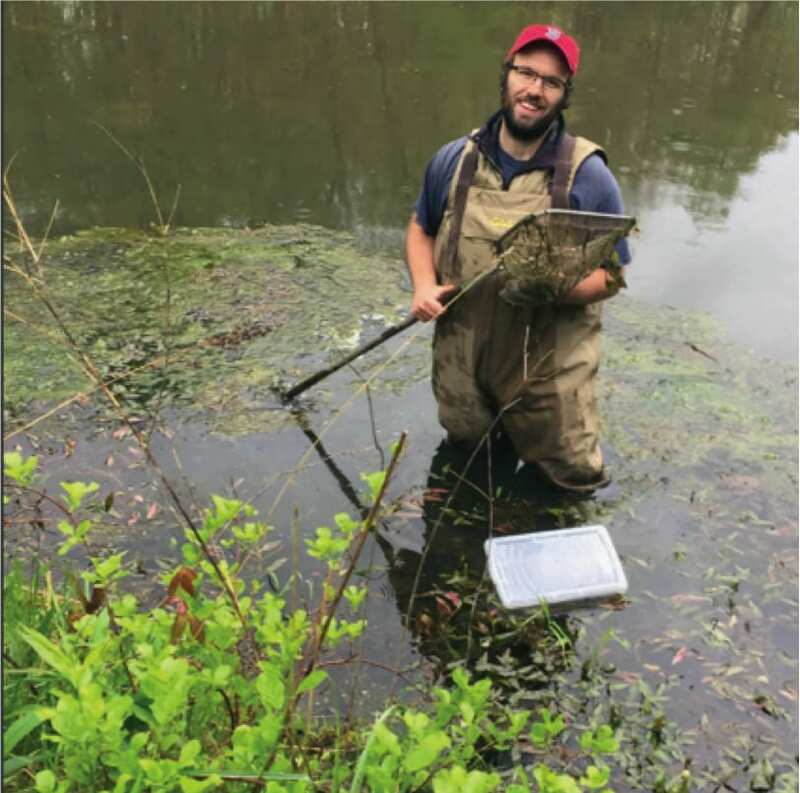 Michael has studied a diverse suite of animals in regions all across the United States—including dragonflies, amphibians, fish, and ladybugs. Michael received a B.S. from Gonzaga University, a M.S. from Murray State University, and a Ph.D. from Case Western Reserve University. Beginning later this summer, he will be starting as a post-doctoral research fellow at the Living Earth Collaborative—a new center for biodiversity research at Washington University, the St. Louis Zoo, and the Missouri Botanical Gardens. He will talk about his recent research on Blue Dashers and using iNaturalist to unravel national differences in the population. We will have guided field trips on Saturday where we get out to find potentially cool dragons and apply our new skills. Field trips will be to local habitats including wildlife areas and state parks. Registration cost is $40 for regular attendees and $10 for students. Don’t wait! Register now and save your spot today! Oh, and did I mention we also plan to have moth sheets in the evening after the main conference? Join us to learn about dragons, but also maximize your cool insect time to see other cool insects at night! 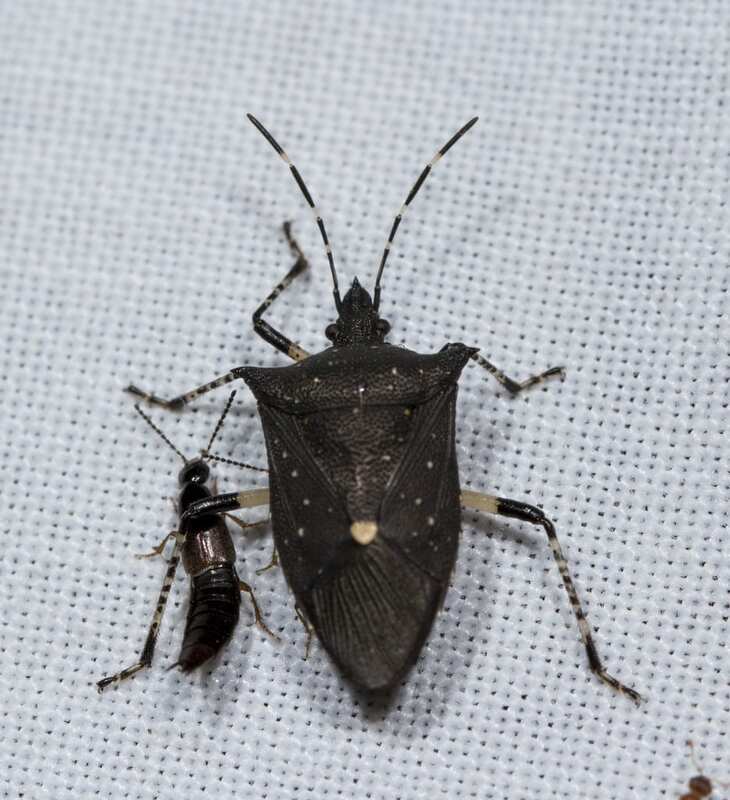 Or maybe documenting native stink bugs or rove beetles is more up your alley? Regardless, there will be cool things to see and people there who will be able to explain why they are cool. 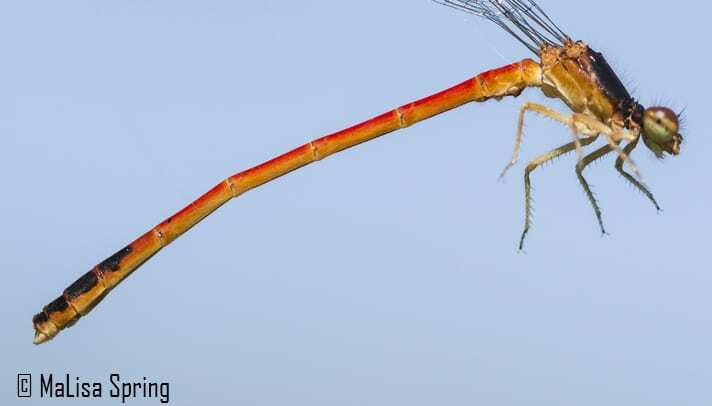 Have you watched a bird eat a dragonfly and then seen them drop the wings on the ground? These wings are valuable scientific material and can help document species (even without the rest of the body). 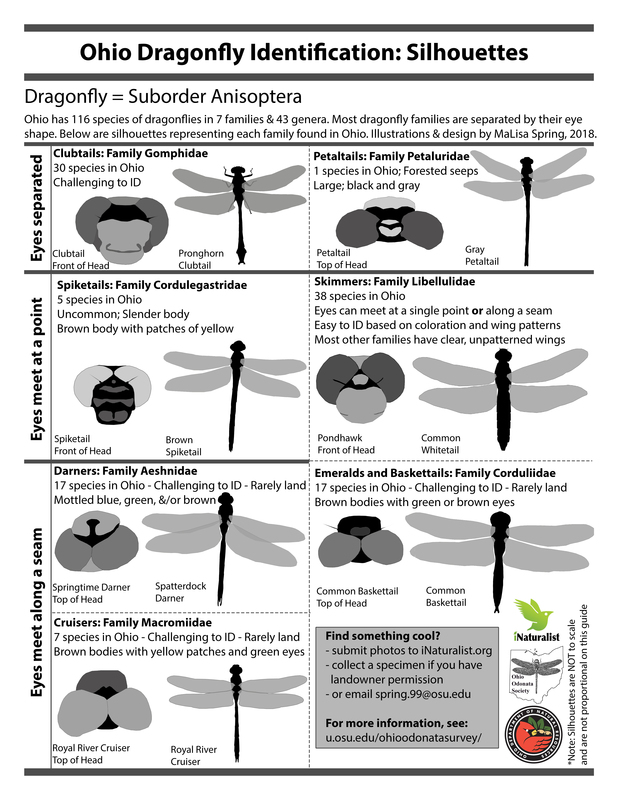 The Ohio Dragonfly Survey is looking for dragonfly wings to add to our knowledge of our 170 species across Ohio. 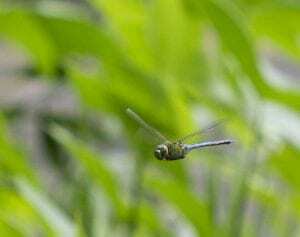 These wings are from a Common Green Darner (Anax junius). 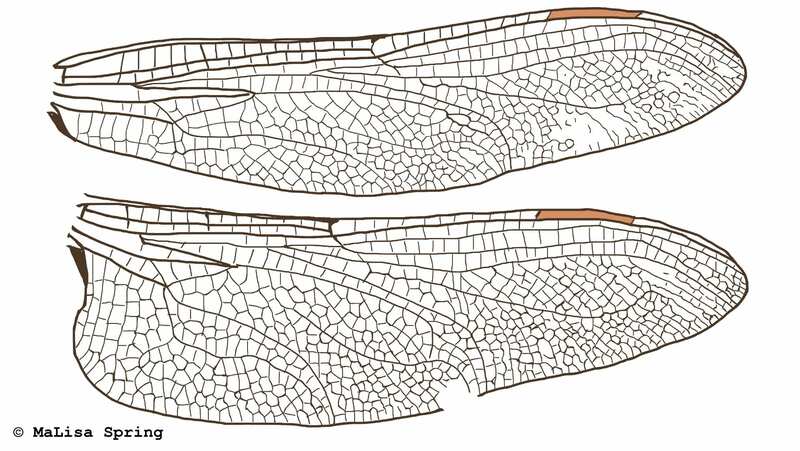 The main veins and overall shape help differentiate it from other dragonflies. 3) you write down the collection information. Typical collection information includes date collected, location collected, your name, and other notes (such as eaten by x species). 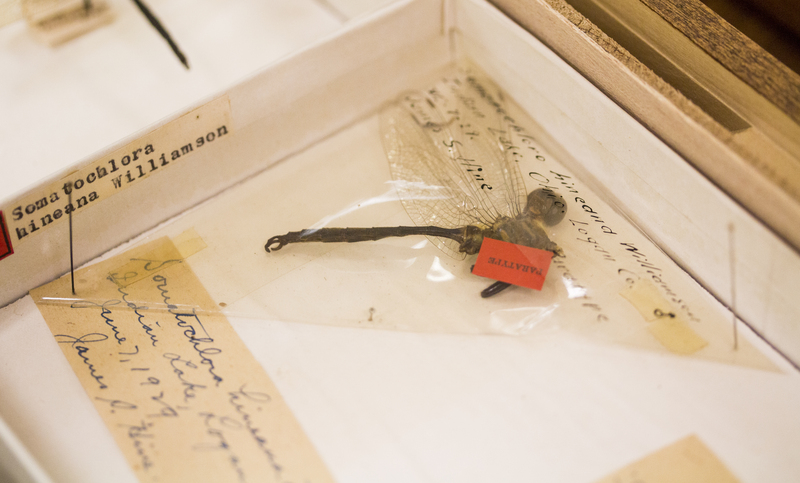 More information on collecting specimens can be found on our physical collections protocol page. Whole dragonflies and damselflies caught in spider webs or in grills of cars are also welcome to be submitted to the survey. 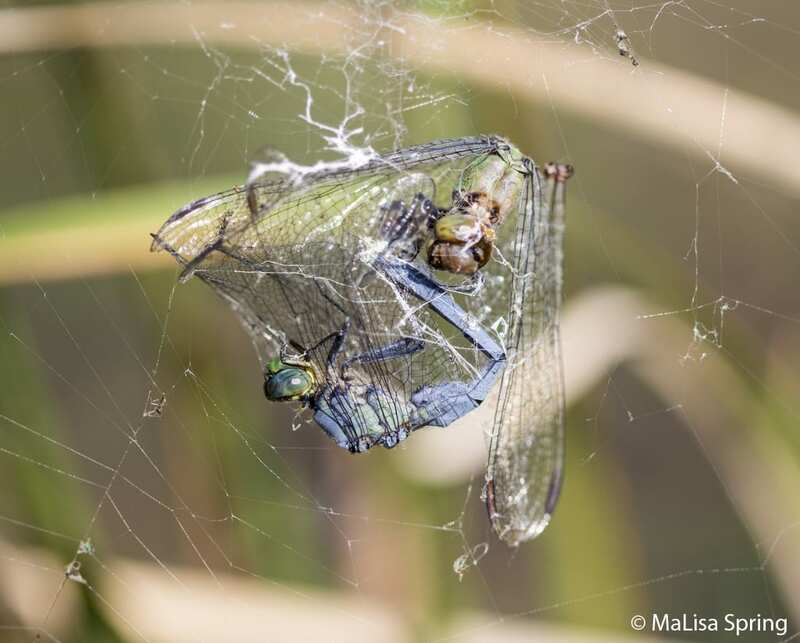 Many dragonflies end up as prey in spider webs. Most spiders cannot eat the entire dragonfly or the husk of the dragonfly is left over. These are dragonflies that were found dead on a road in Minnesota. The group were foraging for prey and did not do well with the incoming traffic. These were collected by concerned Odonatatologists on a single night along a small stretch of road. These dragons were unlucky enough to meet their end with the front of a car. Be sure to check your grill before each stop. You never know what you will find! Even locality data of “somewhere in Ohio” is better than no data. 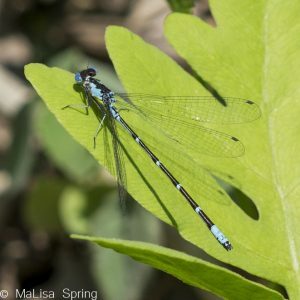 Photos of live dragonflies and damselflies also very welcome and can be submitted to iNaturalist.org. If you have additional questions, feel free to reach out to us. 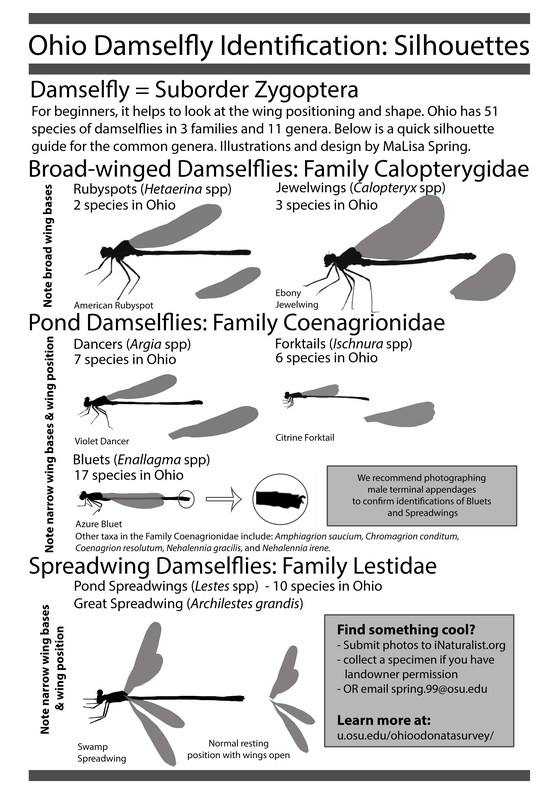 After feedback from attendees of various presentations, I have created a silhouette identification guide for damselflies in Ohio. A dragonfly guide is forthcoming, but I figured I would start with the easier group first. The guide is mainly to differentiate families and give you a starting place of where to look for species groups. This guide and many others are also available on the Resources page of this website. As always, best of luck and find some cool Odes! Aurora damsels did not get many reportings in 2017, but keep an eye out! They have a distinct back pattern with no thoracic stripes and no eye spots! A few people have seen them so far this year. Spring is here! Time for spring training and materials! We have official reports of both dragonflies and damselflies now that it has officially warmed up. With both Common Green Darners (Anax junius) and Eastern Forktails (Ischnura verticalis), we are well on our way to seeing some cool things! There are lots of upcoming events happening. This Thursday (April 26) we are having a spring training for central Ohio residents. If you can’t make it, (or even if you can), I also recommend registering for Odo-Con-18 on June 22-24, which will be our largest Odonata themed event in the state. We hope everyone has fun at our events and learns something new. These events are also times to get supplies and meet with regional coordinators. We have identification resources, species lists, maps, and collection materials for those who request it in advance. We have started our press release push, with articles in The Dispatch and Cleveland.com. If you know anyone at your local newspaper who might be interested in publishing an article on the survey, let us know. We have a statewide press release available on our resources page, but we can write articles directed towards specific regions. We also have a variety of information handouts including general survey background, a wanted poster, Swift Setwing Factsheet, and Hine’s Emerald Factsheet. To get you started for the year, I wanted to point out several changes to our website. We have updated all county list pages that are broken down by geographic region. (Central, Northeastern, Northwestern, Southeastern, and Southwestern). You can view the list of known species by county, but also the species documented in neighboring counties that have yet to be found. This is a good way to target groups and rack up county records. We also updated all species range maps with the help of thousands of observations submitted via iNaturalist last year. These species range maps are available in an annotated pdf that prints off well in grey-scale. For those curious, we also have flight distribution charts to help you learn when to look for species that are either early, mid, or late season fliers. 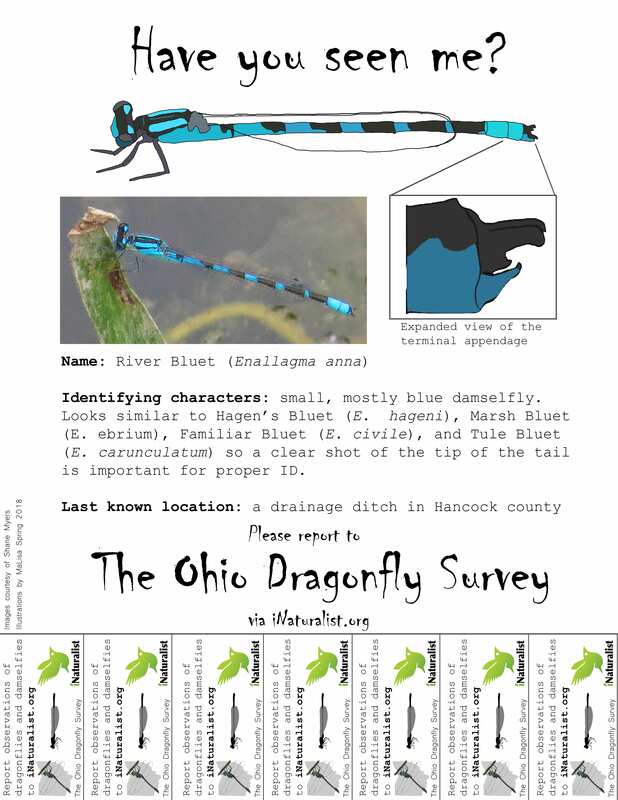 Finally, I have made a printable all Ohio Dragonfly Checklist (as pdf or Excel) and an All Ohio Damselfly Checklist (as pdf or Excel). These can be used in the field or at home to get excited about finding other species. Think you have found a threatened or endangered species? Let us know! – We are up to 85 registered attendees for Odo-Con in June! If you haven’t registered, there is still time, but we are capped at 125 attendees. – Interested in joining other natural projects? There is a new Ohio Tiger Beetle group on iNaturalist! There are several really cool species of these shiny, predatory beetles (and a few endangered ones) that you might encounter while looking for dragonflies and damselflies. 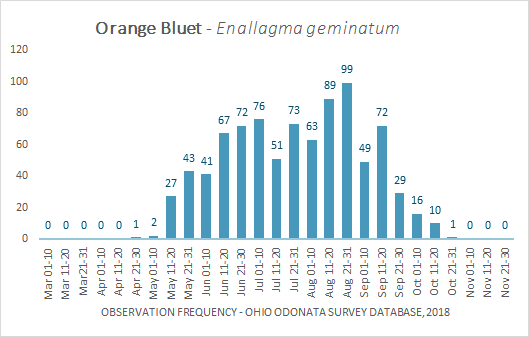 The Ohio Bee Atlas is also looking for more observations of bees on flowers, so don’t be afraid to turn your cameras from dragons to beetles to bees and back again. Let us know if you have any questions and happy searching!